명당지에 남서향으로 자리잡은 초가로, 19세기 후반에 안채를 짓고 20세기 초에 사랑채·아래채·광채를 지으면서 안채를 늘려 지었다. 안마당을 중심으로 'ㄱ'자형의 안채와 그 앞쪽으로 '一'자형의 사랑채, 안채의 왼쪽에 광채가 있어 튼 'ㅁ'자형 배치를 하였다. 또한 사랑채의 오른쪽에는 2칸 정도 떨어져서 '一'자형의 아래채가 자리잡고 있다. 안채는 원래 부엌과 방 2개로 구성된 3칸집이었으나, 후대에 왼쪽의 부엌을 늘리고 오른쪽으로 대청과 방·부엌 겸 헛간으로 사용하는 '헛청'을 덧달았다. 사랑채는 왼쪽에 대문을 내고, 부엌과 사랑방으로 구성되었다. 아래채는 며느리가 거처하는 독립적인 공간으로, 부엌과 방 2개, 광으로 구성되어 살림을 따로 하게 되어있다. 중부지방의 전통적인 농가로, 전통기법에 따라 안채의 앞쪽지붕이 뒷쪽보다 길게 처리된 것이 흥미롭고 며느리의 독립적인 공간을 마련해준 점이 특이하다. 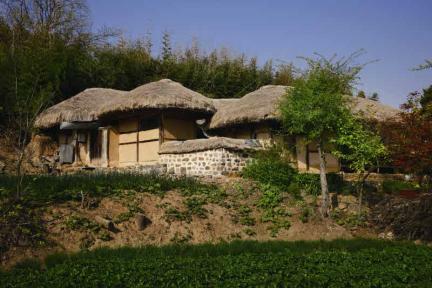 This thatched house is located on a propitious land, facing southwest. 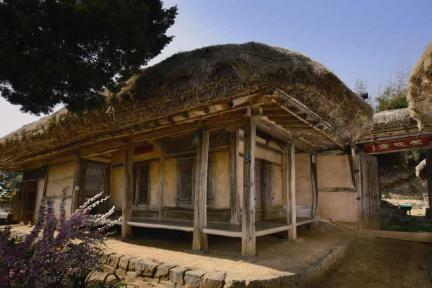 The anchae (women’s quarters) was built in the late 19th century and was expanded in the early 20th century while building the sarangchae (men’s quarters), an annex, and a storage building. 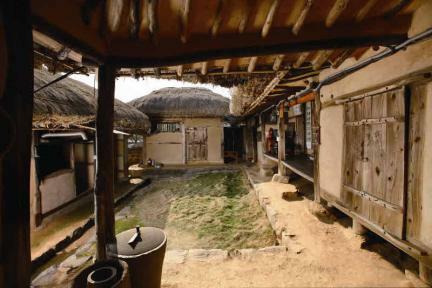 Centering on the courtyard are the “ㄱ”-shaped anchae, “ㅡ”-shaped sarangchae in the front, and storage quarters on the left, forming an overall “□”-shaped layout. On the right side of the sarangchae is the “ㅡ”-shaped annex. 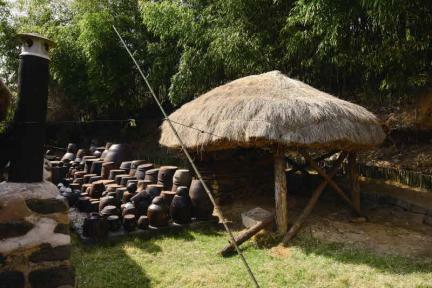 The 3-kan (a unit of measurement referring to the distance between two columns) anchae originally consisted of a kitchen and two rooms, but descendants added the daecheong (main wooden floor) and a barn building equipped with a room and a kitchen to the right. 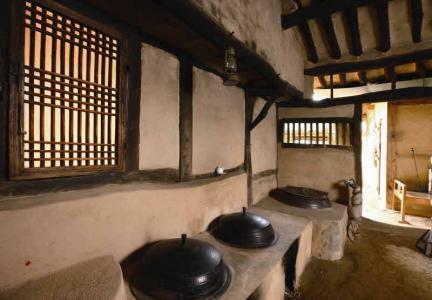 The sarangchae has a gate on the left and a kitchen and the sarangbang (master’s room). The lower detached building is for the daughter-in-law to reside. It consists of a kitchen, two rooms, and a shed to ensure independent living. 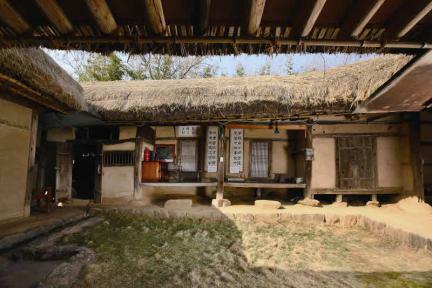 As peculiar features of this typical farmhouse in the central area, the front roof of the anchae is longer than the back roof, and there is a separate building for the daughter-in-law. ※ Viewing of the cultural property above is usually available anytime but may be limited depending on the owner’s personal circumstances.